Formulated to provide important joint support for adult pets, including large breeds and overweight pets. Contains Glucosamine, MSM and Chondroitin plus important antioxidants to help support the structural integrity of joints and connective tissues, also helps alleviate aches and discomfort associated with daily exercise. Liquid 16oz for Dogs and Cats. Shake well before each use, recommended to double the suggested daily amount for the first 3 weeks. 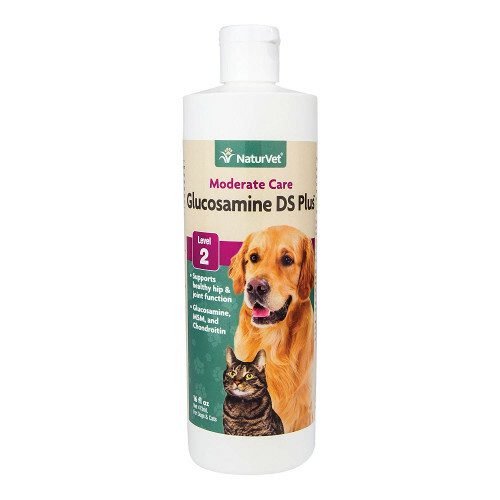 Active Ingredients Per 1-1/2 Teaspoon: Glucosamine, Methylsulfonylmethane, Yucca Schidigera, Chondroitin Sulfate and Vitamin E.
NaturVet Glucosamine DS Level 2 Moderate Joint Care Formulated to Supply Important Joint Support Needs for Adult Pets, Including Large Breeds and Overweight Pets. Contains Glucosamine, MSM and Chondroitin Plus Important Antioxidants to Help Support the Structural Integrity of Joints and Connective Tissues. Helps Alleviate Aches and Discomfort Associated with Daily Exercise. Liquid 16oz for Dogs and Cats. Shake Well Before Each Use. Recommended to Double the Suggested Daily Amount for the First 3 Weeks. 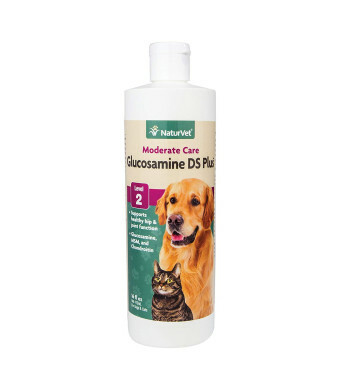 Active Ingredients Per 1-1/2 Teaspoon: Glucosamine, Methylsulfonylmethane, Yucca Schidigera, Chondroitin Sulfate and Vitamin E. All NaturVet Products are Veterinarian Formulated and Manufactured in the USA in an FDA Audited, cGMP Compliant Facility with a 100% Satisfaction Guarantee.